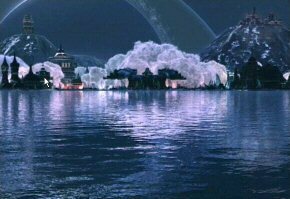 The destruction of the utopia Zanarkand. Speak with the three kids holding their blitzballs out, and you'll be prompted for your name. We'll stick with Tidus, so if you've chosen a different name, Tidus is how we'll refer to him. Then, speak with the girls to get them excited. Tidus obviously knows how to work the women. Note: These can be done in either order, so you could speak to the women first, than the kids. You will then move on to a bridge. Trek forward, speaking with whomever you'd like. They have some interesting information. If you speak to the woman with a pink top and yellow pants, then she'll ask you if you have any spare tickets. If you reply positively, then you'll receive Potion x2 for your trouble. Fight through the crowd and enter the Blitzball stadium for an amazing cinematic sequence. Run down the slope to Auron, Jecht's buddy, and follow him down the bridge. After a few creepy videos, you will receive a sword from Auron and your first battle shall commence against some Sinscales. Listen to Auron; he's a smart guy. Little to no AP will be rewarded, so just fight the ones in front of you and keep moving forward. Don't worry about anything except pressing that Attack button and selecting the ones directly in front of you. There's no need to use any potions. After fighting through those, you will be confronted by the Sinspawn Ammes. You can't lose this battle! Begin this fight by watching a tutorial on Overdrives, and follow the directions to perform Auron's Overdrive, Dragon Fang. Press the buttons in the order directed to perform an extremely powerful move, killing all the Sinscales and damaging Sinspawn Ammes. Even if you don't complete the move, all the Sinscales will still die. Now that you don't have to worry about the Sinscales, you can focus on Sinspawn Ammes. Since there is a Save Point immediately following the fight (which heals your characters) and the boss cannot kill you, it wouldn't be foolish to save Tidus' Overdrive. However, you wouldn't be saving it for much, so use it to speed up the fight. Continue to attack Sinspawn Ammes until he's defeated. His only move is Demi, which deals exactly one quarter of the character's current health (so it can never kill you). Recover at the Save Sphere and continue to follow Auron up the slope. As you continue further, you will soon realize the danger of the situation you are in. You are completely surrounded by Sinscales that return after you kill them, so what's the point of killing them? Well, first of all, you'll have to attack two. They die in one hit, but that won't matter because they will return. Then, Auron will notice the Tank Lorry that can be hit instead. This is a boss battle of sorts. Auron hits much harder than Tidus, but Tidus can still defeat a Sinscale in one hit if he manages to get a critical hit. Obviously you want to get rid of the Tank as fast as possible, so you would want the big-hitter to focus on it. 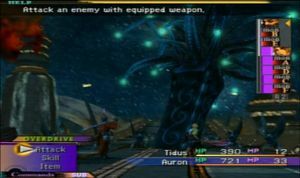 So, have both Tidus and Auron attack the Tank unless one of the Sinscales charge their fins. When this happens, first check if that specific Sinscale will be going again before Tidus can attack it later. If not, just attack the Tank for now. But, if so, you can use Tidus to kill it before it can use its move: "Pins." Although this isn't all that powerful, it causes the most damage out of all of their attacks so avoid it. If you want, though, you can just focus on the Tank and knock it off as fast as possible. This page was last edited on 28 April 2014, at 15:28. This page has been accessed 44,093 times.